Glass & Stainless Ltd has an extensive range of products available for quick delivery. Not only do we supply a large range of glass and stainless steel components but we have developed our own product systems to make designing and ordering simple. 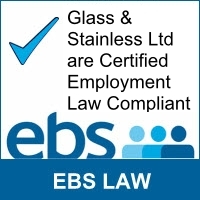 Glass and stainless offers a nationwide delivery service. Standard lead-time on toughened glass is 5-7 working days and toughened laminated is 10-14 days. All other glass lead time on order, however an express service is available on all products if required. As a supplier of bespoke glass, designer canopies and balustrades to both trade and the general public we have extensive knowledge of the various systems and components that are needed to complete a project. If you have any questions please don’t hesitate to contact us to see if we can help.